As the 2016 General Conference session concluded today, many in our denomination, as well as many of you back home, leave with questions about the approved Council of Bishops plan entitled, “A New Way Forward” (see below for more information on the plan). 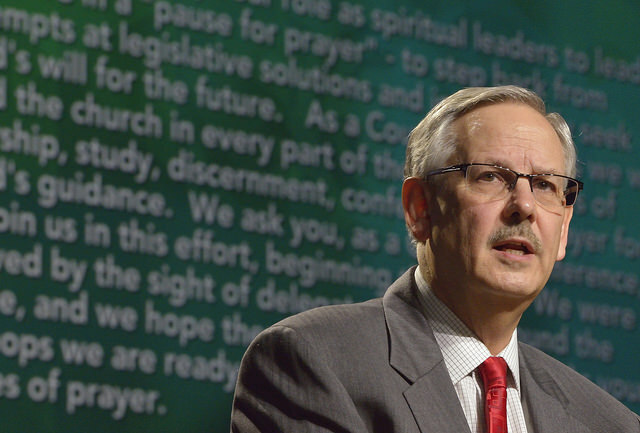 Bishop Bruce R. Ough, president of the Council of Bishops and leader of the Minnesota Conference, addressed the General Conference today, May 18, 2016. He presented, "An Offering for a New Way Forward" to the plenary floor, as a follow up to yesterday's approved motion asking the Council of Bishops to meet and outline a way forward. (Click here to read yesterday's statement from the Council of Bishops). After discussion on Wednesday afternoon, General Conference delegates voted 428 - 405 to approve the plan. Below is the text from today's presentation of the new way forward. UNITY We believe that our unity is found in Jesus Christ; it is not something we achieve but something we receive as a gift from God. We understand that part of our role as bishops is to lead the church toward new behaviors, a new way of being and new forms and structures which allow a unity of our mission of "making disciples of Jesus Christ for the transformation of the world" while allowing for differing expressions as a global church. Developing such new forms will require a concerted effort by all of us, and we your bishops commit ourselves to lead this effort. We ask you, as a General Conference, to affirm your own commitment to maintaining and strengthening the unity of the church. We will coordinate this work with the various efforts already underway to develop global structures and a new General Book of Discipline for our church. Strengthening the unity of the church is a responsibility for all of us. PRAYER We accept our role as spiritual leaders to lead the UMC in a "pause for prayer" - to step back from attempts at legislative solutions and to intentionally seek God's will for the future. As a Council of Bishops, we will lead the church in every part of the world in times of worship, study, discernment, confession and prayer for God's guidance. We ask you, as a General Conference, to join us in this effort, beginning this week. We were moved by the sight of delegates praying around the table, and we hope these efforts will continue. As your bishops we are ready to join you and to lead you in these times of prayer. PROCESSES We have discussed in depth the processes which might help our church heal and move forward - up to and including the possibility of a called General Conference in 2018 or 2019. We have not finalized our plans for such processes, but we will keep working on options we have heard from many of you, and we will keep reporting to this General Conference and to the whole church. CONTINUING DISCUSSIONS We will continue to explore options to help the church live in grace with one another - including ways to avoid further complaints, trials and harm while we uphold the Discipline. We will continue our conversation on this matter and report our progress to you and to the whole church.